The cluster of islands with the mighty Vembanad Lake in the backdrop is what makes Kumarakom an enchanting backwater destination, worth a place to be called "Little Venice". This beautiful land is prosperous with coconut groves, mangrove forests and paddy fields. Kumarakom possesses a wide variety of tropical flora and fauna. The backwaters of Kumarakom is home to many aquatic lives like Karimeen, Konju (Tiger Prawns), and Chemmeen (Prawns). Being an ornithologists paradise, Kumarakom houses various species of birds like waterfowl, egrets, teals, darters, herons, cuckoo, wild duck and migratory birds like the Siberian Stork. You can experience the nature at its full glory at Kumarakom. Besides Kumarakom Bird Sanctuary, the Aruvikkuzhi Waterfall is the major attraction of Kumarakom. The Thazhathangady Mosque is one of the Heritage Zones of Kerala, worth visiting. Quick & short treks, boating, birdwatching, angling, strolling are some of the activities that the tourists enjoy in Kumarakom. A ride on the traditional Kettuvallom offers a great experience for the travelers. Fishing is also available here. History buffs will be excited to visit the Bay Island Drift Museum near the Kumarakom beach. A visit to Kumarakom will not be complete without trying the authentic fish dishes of Kumarakom. The Karemeen pollichethu in banana leaves will take you to another world of taste. A must visit destination for those who love nature, birds, waterfalls, history and food. Go birdwatching at Kumarakom Bird Sanctuary. Enjoy the tranquility of Kumarakom Backwaters. Feel the enchanting charm of Aruvikkuzhi Waterfall. Take a boat ride along the Vembanad Lake. Escape to the Kumarakom Beach. Relish forest trail through Pathiramanal Island. Witness the admirable woodwork on driftwood at the Bay Island Driftwood Museum. Thazhathangady Mosque (Juma Masjid), a must visit for architecture lovers. Make sure to visit Kumarakom Bird Sanctuary at the sunrise as it is the best time for birdwatching. Don't forget to take binoculars if you love bird watching. Must try tasty Kerala delicacies especially Appam, Karimeen, Kappa and Fish curry. 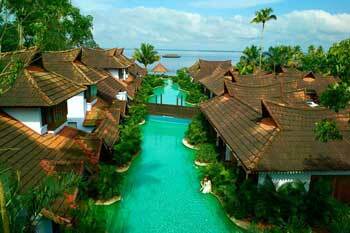 The pleasant weather of winter (September to March) makes it the best time to visit Kumarakom. Avoid visiting Kumarakom throughout the summer months of March to June. The maximum temperature reaches up to 37°C during this season. Visit Kumarakom in the monsoon months of June to September to spot migratory birds. By Air : Cochin International Airport located at a distance of 73.1 Km is the nearest airport to Kumarakom. By Train : Kottayam Railway Station located at a distance of 15.6 Km is the nearest railway station. By Road : Kumarakom has a good network of road connecting to major cities of Kerala. You can purchase almost everything from Kumarakom Market. Get handicrafts of Kerala from Old curiosity shop. For the best brands of fashion clothes, visit Paris Stores in Kumarakom. Buy Kathakali masks and brass handicrafts from Street marts.